If you’re thinking it’s time to teach your kids about money, you’re probably right. Regardless of your kid’s age, if they are old enough to learn about responsibilities at home like chores, they’re old enough to learn the basics of how money works. Does your child understand the connection between work and money? This is the starting point for teaching your youngsters about money. Money doesn’t just “happen.” How often we’ve heard “money doesn’t grow on trees.” But how often have we been shown this lesson? The simplest, most direct way to show children the connection between money and work is through the idea of allowance. The traditional concept of an “allowance” is that your kid gets money, just because. While there’s nothing inherently bad about allowances, they are missed opportunities. Allowances are unskillful because they don’t teach a lesson. Commissions, on the other hand, can be a very fruitful way to educate your child about money. A commission is simple — whether it’s putting away their toys or folding their shirts, your kids can add value to the household by making a small contribution — i.e., chores! Instead of handing kids money “just because,” giving them an opportunity to earn money based on the value they add teaches them what work is about — a transaction where value is exchanged for currency. In this way, your child won’t be entitled to that allowance. They’ll have earned their commission. Once you’ve got your kid squared away on how they earn money, the next step is to teach them to be stewards of that resource. If your child wants to buy something, the money needs to come from somewhere. By setting up multiple jars, you can show them that not all money is for immediate spending. 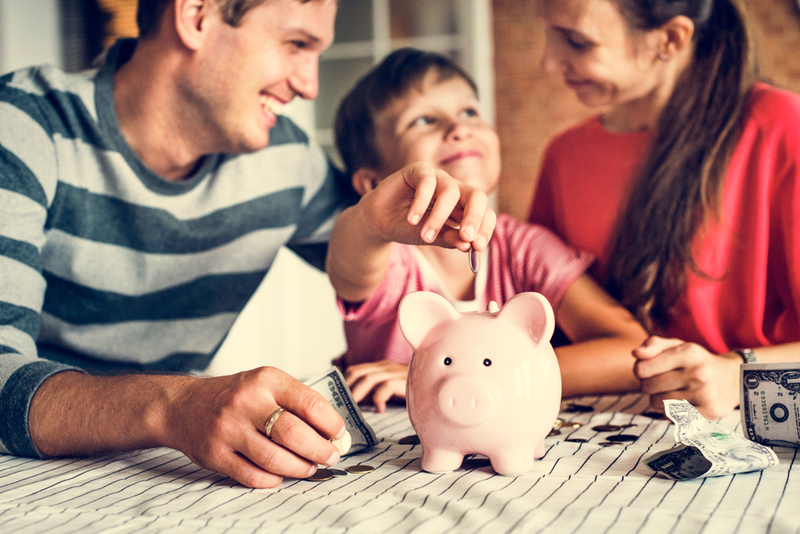 Getting them into the habit of saving money for the future and for charitable giving allows them to learn how to start thinking about money in a balanced way. Chances are, your child wants some stuff — toys, athletic gear, video games. These things add up. We don’t have an opinion on how much to pay your kids for chores or commissions, nor do we have an opinion about how much you should spend on your children. That being said, by pressing your child to save up money for the things they want, you can teach them a valuable lesson about entertainment. So much goes into advertising to children that entertainment can become disproportionately overvalued. By refusing to buy your kids all the stuff they want, outright, you are acting to disrupt the expectation that they should be entitled to everything that advertisers push on them. The truth is, it’s harder to teach contentment than it is to allow children to be entitled. Furthermore, contentment is far more valuable lesson than any of the others. Teach them to shop differently, to spend differently, and to relate to entertainment differently. If you walk the walk, you don’t have to spend so much time talking the talk. Children hear what you have to say, but when they really see you, they will act like you. When your behavior around money is healthy, your kids will get healthy messages from that. So, teaching your kids about money starts with putting some healthy money behaviors into practice.